We have so many wonderful clients that it was hard to pick somebody for our new client snapshot post! Andrew & Kristine came to us recently with a request to have a front garden makeover, and we were delighted to be able to help them out. The front garden of their beautiful home was sadly in need of a re-vamp. Comprising mainly of lawn, it was overgrown and full of weeds. 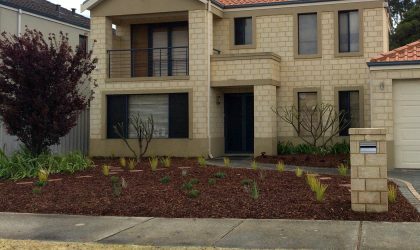 “Our front garden was very high-maintenance and hard to look after. It had gotten to the point where it was so out-of-hand that everything had pretty much died,” said Andrew. Andrew & Kristine wanted to get rid of the bulk of the lawn because it needed so much water and was difficult to keep under control. At the same time, they also wanted to retain the coolness of the area and create an air-flow, as well as create a space that was Low-maintenance. 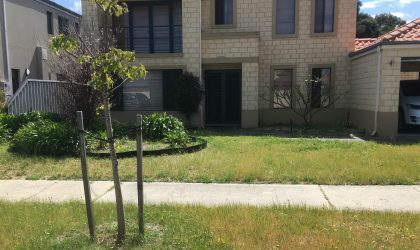 After a team discussion, we decided the best solution for Andrew & Kristine’s area would be to remove the lawn and then prepare the soil for planting with Australian natives like, Lomandra Lime Tuffs, Pimelias, Conostylis, Callistemons and Kangaroo Paws. The last step was to protect the health and micro biology of the soil by adding a layer of quality pine bark mulch. This quality pine bark mulch has the added benefit of not only keeping the soil moist and cool but also suppressing weeds. Wanda’s team also replaced the old reticulation box and made the necessary repairs and changes to ensure the new garden would thrive. “Once the plants have grown, that will pad the whole area out and blend everything together. So far, it’s looking really good,” said Andrew. For more information about how the team at Wanda’s can transform your garden with a makeover, talk to us today. You can call us on 9450 6165, or complete our customer contact form here.